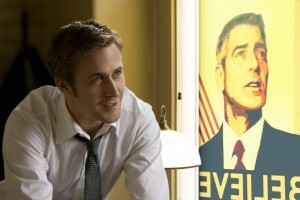 The Ides of March, the highly anticipated new film written & directed by George Clooney, will be the opening film – in Competition – at the 68th Venice International Film Festival. Based on Beau Willimon‘s play Farragut North, screenplay written by George Clooney & Grant Heslov and Beau Willimon, The Ides of March is set in the near future, in the world of American politics during the Democratic primaries in Ohio for the presidential elections. It tells the story of a young, idealistic press secretary (Ryan Gosling) who works for one of the presidential candidates, Governor Mike Morris (George Clooney), and despite himself becomes dangerously involved in the ambient deceit and corruption. Along with Ryan Gosling and George Clooney, The Ides of March also stars Philip Seymour Hoffman, Paul Giamatti, Marisa Tomei, Jeffrey Wright, Max Minghella, and Evan Rachel Wood. The technical cast is also topnotch: Phedon Papamichael (cinematographer), Stephen Mirrione (editor), Sharon Seymour (production designer), Louise Frogley (costume designer). The 68th Venice International Film Festival will take place on the Lido from August 31st to September 10, 2011, directed by Marco Mueller and organized by la Biennale di Venezia chaired by Paolo Baratta. The Ides of March will have its world premiere screening on the evening of August 31st in the Sala Grande (Palazzo del Cinema), following the opening ceremony. Columbia Pictures, Cross Creek Pictures and Exclusive Media Group present the film, which is produced by Heslov and Clooney and Brian Oliver. Executive producers are Leonardo DiCaprio, Nina Wolarsky, Jennifer Davisson Killoran, Stephen Pevner, Nigel Sinclair, Guy East, Todd Thompson, and Barbara A. Hall. The Ides of March is a Smokehouse / Appian Way Production, distributed internationally by Exclusive, domestically by Sony, and released in Italy by Rai Cinema / 01 Distribution. The Ides of March is the fourth film directed by George Clooney, who began his career as an acclaimed television actor and has become one of the major stars in contemporary cinema (he won an Oscar in 2005 for Syriana), an important director, screenwriter and producer. Clooney made his debut behind the camera in 2002 as the director of Confessions of a Dangerous Mind, which won the Special Achievement in Film award from the National Board of Review. His second film as a director, Good Night, and Good Luck. (2005) was successfully presented in Competition at the 62nd Venice International Film Festival, where it won the Osella for Best Screenplay (to Clooney and Grant Heslov) and the Coppa Volpi for Best Actor (to David Strathairn). It also was nominated for six Academy Awards – including Best Picture, Best Director, and Best Screenplay – and for five Golden Globes. He returned behind the camera in 2008 to direct the comedy Leatherheads, in which he starred alongside Renée Zellweger. George Clooney is recognized as much for his global humanitarian efforts as he is for his accomplishments in the entertainment industry. Clooney’s achievements as a performer and a filmmaker have earned him an Academy Award, two Golden Globes and an Emmy, as well as four other Oscar nominations, six additional Golden Globe nominations, and numerous SAG, BAFTA, Emmy and Critics’ Choice Awards. In 2006 he received the American Cinematheque Award and the Modern Master Award from the Santa Barbara Film Festival. When Clooney received his Oscar for Best Supporting Actor for “Syriana” in 2006, he also earned Academy Award nominations for Best Director and Best Original Screenplay for “Good Night, And Good Luck.” It was the first time in Academy history that an individual had received acting and directing nominations for two different films in the same year. In addition, he won the Golden Globe for Best Supporting Actor for “Syriana” and was nominated for SAG, BAFTA and Critics’ Choice Awards for his work in that film. Clooney made his directorial debut in 2002 with “Confessions of a Dangerous Mind” for Miramax, winning the Special Achievement in Film Award from the National Board of Review. In addition to Oscar nominations for writing and directing his second directorial project – “Good Night, and Good Luck.”- Clooney received the Paul Selvin Award from the Writers Guild of America and the Freedom Award from the Broadcast Film Critics Association. The film also earned Clooney nominations for two Golden Globes, two BAFTA Awards, a SAG Award, an Independent Spirit Award, two Critics’ Choice Awards, a WGA Award and a DGA Award. Clooney received critical acclaim for the award-winning drama “Three Kings” (Warner Bros.) and the Oscar-nominated “Out of Sight” (Universal). His other performing credits include “Solaris” (FOX), “The Peacemaker” (DreamWorks), “Batman & Robin” (Warner Bros.), “One Fine Day” (20th Century Fox,) “From Dusk ‘Til Dawn” (Miramax) and “Burn After Reading” (Focus Features). This last film reunited him for the third time with the Coen brothers. (He also worked with them on “O Brother, Where Art Thou?,” which earned him a Golden Globe for Best Actor in a Motion Picture Musical or Comedy, and on “Intolerable Cruelty.” Clooney refers to the three films as “my trilogy of idiots.”). In 2009, Clooney starred in and produced “The Men Who Stare at Goats,” which was a Smokehouse Production, the company he formed with Grant Heslov. Smokehouse’s initial project was the romantic comedy “Leatherheads,” which Clooney also directed and starred in for Universal. Clooney is currently in post-production on the political thriller “The Ides of March,” Smokehouse’s first production under their new deal with Sony Pictures. Clooney directs and also stars in the film, along with Ryan Gosling, Paul Giamatti, Marisa Tomei and Evan Rachel Wood. It is filming in Ohio and Michigan and is slated for an October 2011 release. On television, Clooney starred in several series earlier in his career, becoming best known to TV audiences for his five years on the hit NBC drama “ER.” His portrayal of Dr. Douglas Ross earned him Golden Globe, SAG, People’s Choice and Emmy Award nominations. In 2009, Clooney returned for one final episode in which his character was reunited with his longtime love. For Section Eight’s television division, Clooney was an executive producer and directed five episodes of “Unscripted,” a reality-based show that debuted on HBO. He also was executive producer and cameraman on “K Street,” also for HBO. Clooney was executive producer and co-star of the live television broadcast of “Fail-Safe,” an Emmy-winning telefilm developed through his Maysville Pictures. “Fail-Safe” was nominated for a 2000 Golden Globe Award as Best Miniseries or Motion Picture Made for Television. The telefilm was based on the early 1960s novel of the same name. In 2007, Clooney, Brad Pitt, Matt Damon, Don Cheadle and Jerry Weintraub co-founded “Not On Our Watch,” an organization whose mission is to focus global attention and resources to stop and prevent mass atrocities in Darfur. Among the many honors received as a result of his humanitarian efforts in Darfur was the 2007 Peace Summit Award, given at the eighth World Summit of Nobel Peace Prize Laureates at their annual meeting in Rome. Also taking part in the ceremony were Rome’s Mayor Walter Veltroni, Lech Walesa, Mikhail Gorbachev and the Dalai Lama. In 2008, Clooney was designated a U.N. Messenger of Peace, one of eight individuals chosen to advocate on behalf of the U.N. and its peacekeeping efforts. In January of 2010, Clooney, along with Joel Gallen and Tenth Planet Productions, produced the “Hope for Haiti Now!” telethon, which raised more than $66 million, setting a new record for donations made by the public through a disaster-relief telethon. The Academy of Television Arts and Sciences awarded Clooney with the Bob Hope Humanitarian Award at the 2010 Primetime Emmys. He was the fourth recipient of this prestigious award. Later that year, Clooney received the Robert F. Kennedy Ripple of Hope Award for his dedication to humanitarian efforts in Sudan and Haiti. In December of 2010, Clooney along with the United Nations, Harvard University and Google, launched “The Satellite Sentinel Project,” an effort to monitor violence and human-rights violations between Southern and Northern Sudan. Not on Our Watch funded new monitoring technology, which allows private satellites to take photographs of any potential threats to civilians, detect bombs, observe the movement of troops and note any other evidence of possible mass violence.